Asia Art Center is pleased to announce the opening of "Sleeping Lake - Solo Exhibition of Yin Qi" on July 28th, 2018. The exhibition will be on view through September 16th, 2018. Yin Qi, born in Beijing in 1962, graduated from the Department of Oil Painting at Central Academy of Fine Arts in 1987, and taught at the academy after graduation; he moved to France in 1989, and graduated from École Nationale Supérieure des Beaux-Arts in Paris in 1996. He currently lives and works in Beijing and Paris. Yin Qi's paintings explore the relationship between space and matter, as well as people and their internal soul. His paintings do not directly speak about objective matters; instead, they possess a consciousness towards self and surroundings, as well as sensitivity for matters, nature and people, an awareness of the idea that we are all connected and intertwined. His paintings strip away the initial complexities and attempt to confront the original drifting minds and the genuine physical process in painting. Yin Qi began creating print works at the IDEM printing studio in Paris in 2016. Founded in 1880, IDEM was the most famous printmaking creative center in 19th-century Paris; Picasso, Matisse, Miró, film director David Lynch, and other great masters of art have all created print works here. This exhibition will present Yin Qi’s latest paintings, including oil, print, and mixed media works. There is an intriguing phenomenon through the observation of the development of Modernism; Modernism was born out of the dissolution of elements, this form of subjective projection slowly becomes a self-systemized artificial reality. It turns out that it is through this artificial reality that people are transformed—behaviors, lifestyles, brains, eyes are transformed, and the existence of humans is thus passively altered. It is an outward projection of energy, like a freeway stretching from self to reality. Self-transformation could also be a high-speed road returning from the point of reality. Art can abandon the stubbornness for an innovation in form, an almost hysterical desire; it can also discard the perplexing and helpless form of critical thinking of reality. 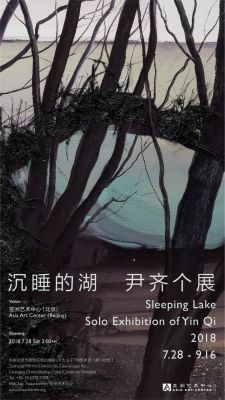 Sleeping Lake refers to the settling process of consciousness, a form of dormancy at the physical level. The process of painting is a matter in deep slumber; the matter is an accumulation of body, mind, organs, nerves, consciousness and more with the depth of materials. The closing of a channel leads to the opening of another channel. After shutting down rationality, ideology, and critical thinking, the channel of instinct, awareness, and a higher existence thus emerges. Isn’t that the most profound politics of all is the change in oneself?